This summer, 54 high school students in the U.S. Air Force Junior Reserve Officer’s Training Corps are training to become pilots at Liberty University. The training is part of a nationwide, $2.4 million USAF effort to address the pilot shortage and to increase diversity in the aviation industry. While many of their peers are just starting to drive cars, 54 high school students in the U.S. Air Force Junior Reserve Officer’s Training Corps (AFJROTC) are training to become pilots in a summer program at Liberty University School of Aeronautics (SOA). The cadets (mostly rising juniors and seniors) have been awarded scholarships by the Air Force to earn their private pilot license. All expenses, including housing, food, equipment, and flight training costs, are covered by the Air Force. The scholarships are part of a nationwide $2.4 million USAF effort to address the pilot shortage (over 500,000 pilots will be needed over the next 20 years, according to a report by Boeing) and to help increase diversity in the aviation industry. Liberty was one of just six partner universities chosen to train the selected applicants this summer. More cadets are training at Liberty than any other institution. This year, the Air Force approved 120 scholarships and plans to grow the program to 250 scholarships next year, with 1,200 annually in the future. The Air Force hopes to attract high achieving cadets from the program to become its next generation of pilots and help fill its share of the national pilot shortage, about 2,000 pilots. The 54 cadets came to campus for six-to-eight weeks of training, with the first group arriving May 28. Cadets will be training through August. 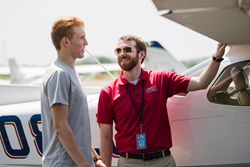 While on campus, they are enrolled as Liberty students and take four academic courses (12 university credit hours) in the Private Pilot Certificate program. Cihak said this gives them a head start in college with a year’s worth of flight training completed. 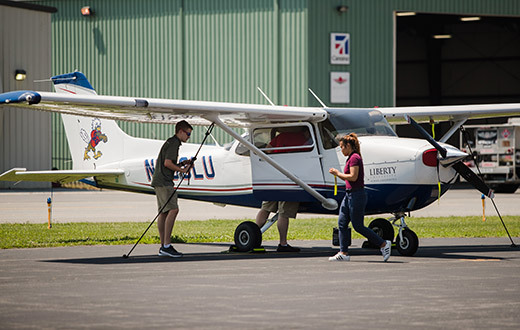 As part of the program, Liberty is preparing the cadets for the Federal Aviation Administration (FAA) practical evaluation — required to obtain a license — and will schedule FAA evaluators to administer both the oral and flight tests. Interested in a future military career, Elijah Seals, a cadet from Phoenix, Ariz., knew an Air Force scholarship and a private pilot license were too valuable to his résumé to pass up. Seals, who at 16 is one of the youngest cadets, plans to stay an extra week in Lynchburg so that he will be eligible to take the FAA evaluations on his 17th birthday on July 24, a few days after the first session wraps up. But the community aspect is what has made the time at Liberty truly memorable. “I’ve met people from all over the U.S. — there are some from Colorado, Utah, Ohio — and everybody is just great,” he said. Sadie Schindler, 16, of Springboro, Ohio, agrees. She said she’s always wanted to go into the Air Force and that the program has encouraged her to consider a career in aviation.